Dating app Coffee Meets Bagel is launching a premium service that gives subscribers information about their potential suitors’ activities and makes it easier for them to access and spend the in-app currency that makes the company money. The premium subscription costs $34.99. Coffee Meets Bagel doesn’t charge for its basic services, but it does let people buy its in-app currency—called beans—to be spent on various extra items. That includes the cost of discovering the hidden identity of a mutual friend (99 beans), or paying to have the app alert another user that you like them (385 beans). The service sends out daily alerts to both male and female users about potential matches, using an algorithm that searches Facebook friends. The beans alone cost $24.99 for 3,000 or $1.99 for 100. The premium service gives subscribers 6,000 of the in-app beans. They can also spend the currency to receive more daily matches via e-mail. Men receive 21 matches each day, while women get six, and those six are all of men who have already indicated they’re interested, the company says. The premium service was added because some users didn’t want to have to frequently replenish the in-app currency, says Dawoon Kang, one of three sisters who co-founded the company in 2012. The currency is the only way the company currently makes money, Kang wrote in an e-mail. 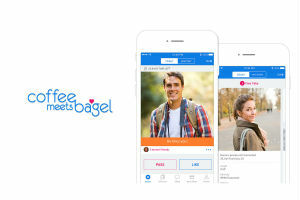 Coffee Meets Bagel, launched in New York and Boston and now headquartered in San Francisco, received a $7.8 million Series A funding round in 2015 led by DCM Ventures, along with Quest Venture Partners and Azure Capital. The founders appeared on the ABC TV show “Shark Tank” in January 2015, but didn’t take an investment. Mark Cuban asked the founders if they would sell the business for $30 million, if he offered that. They said they wouldn’t.